The General Elections Commission has staged the first of a series of public debates between the two presidential candidates. One can expect them to offer fresh policy insight on many issues, including foreign policy. As we are facing a dynamic international order — from Brexit to United States President Donald Trump’s trade war with China — Indonesia needs to adjust to external challenges. A specific session for the candidate pair of Joko “Jokowi” Widodo and Ma’ruf Amin to debate foreign policy with the duo of Prabowo Subianto and Sandiaga Uno will take place on Jan. 30. However, looking at the performance of the two candidate pairs in the first debate, held last Thursday, we may have doubts as to whether they will address crucial issues in our foreign policy. The presidential tickets have included foreign policy in their vision and mission statements, albeit framed in either an economic or security and defense context. The platform of Jokowi-Ma’ruf links diplomacy and foreign policy to “human and territorial protection”. It also outlines some economic aspects in the duo’s foreign policy agenda through the notion of a “competitive economy”. The Prabowo-Sandiaga duo, on the other hand, prioritizes an “independent defense and security system”, with the ability to protect territorial integrity and national unity. While their foreign policy agendas have yet to be outlined in detail, at first glance both presidential candidates tend to see foreign policy as an extension of domestic politics. Both rely upon the classic concept of a “free and active foreign policy”. This is a position the two held onto since their battle in the 2014 election, which only reflects an inward-looking foreign policy concept. This inward-looking foreign policy outlook has been typical of Indonesian presidents, except, to a large extent, Sukarno, Abdurrahman Wahid and Susilo Bambang Yudhoyono. At least three characteristics usually appear in this foreign policy style. First, an inward-looking foreign policy usually prioritizes domestic interests over strategic alignment in international politics. Jokowi, for example, once asked Indonesia’s embassies to promote economic investment abroad, which reflects a desire to use foreign policy to serve economic interests at the national level. Indonesia also tends to prefer bilateral engagement over participation in multilateral forums — which reflects Indonesia’s reluctance to claim leadership over crucial regional issues in ASEAN. Second, competing institutions usually engage in the foreign-policy making process. With the absence of strong presidential intervention in foreign policy, the Foreign Ministry has been the vanguard of foreign policy. However, in a tradition dating back to the New Order regime, several other institutions (for example, big think tanks, the military, the Trade Ministry or intelligence authorities) also engage in foreign policy, which to some extent overlaps with formal diplomatic activities in Indonesia’s foreign policy. Third, as a consequence, Indonesia has been less salient in multilateral institutions, with a greater emphasis on bilateral outreach. This is not a negative achievement, as Indonesia has been able to engage with nontraditional partners, such as African or South Asian states in the last five years. Thus, with the tendency to pursue an inward-oriented foreign policy, neither candidate may be interested in talking about major strategic issues in international politics, such as the trade war, ASEAN, or the emerging Indo-Pacific order. However, we should expect them to provide a better strategy to engage with nontraditional partners, improve institutional coordination and craft a foreign policy that is more visible to all citizens. This is what we may expect for the upcoming presidential debate on foreign policy. 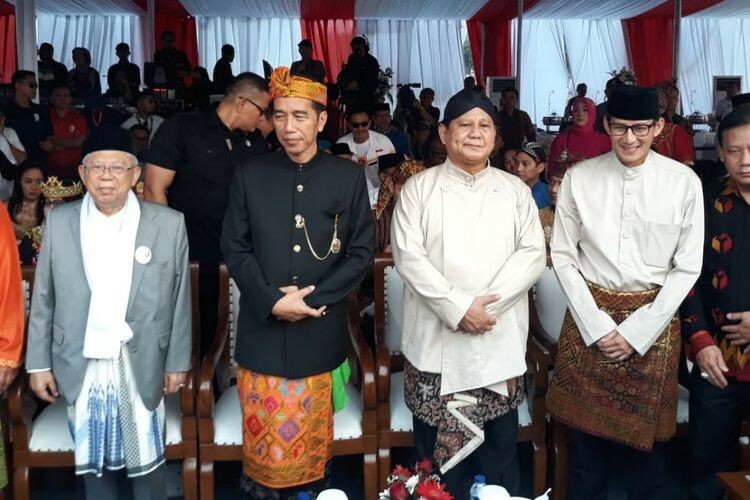 Both Jokowi-Ma’ruf and Prabowo-Sandiaga tend to hold onto this inward-looking outlook with highly nationalistic jargon. This is totally fine and acceptable for a presidential campaign. However, engaging with strategic regional issues is also inevitable, even when the government has an inward-looking outlook and a nationalist vision. For example, a presidential candidate is expected to have a clear, rational vision over the Regional Comprehensive Economic Partnership (RCEP) in ASEAN, which is being negotiated among Southeast Asian states and their regional partners. The RCEP will drive ASEAN relations with strategic partners, most notably China, India, Australia and the US, in terms of economic cooperation. Indonesia must also be aware of the rising tension between China and the US. Even though Indonesia is not seen as being directly affected by the conflict, the world’s two largest economies could turn Southeast Asia into a second front of their tension, which may affect Indonesia. It is in this context that discussing strategic regional and international issues is necessary in the presidential debate. So far, none of the presidential candidates has offered a new strategic doctrine to deal with these regional and international dynamics. Although it could be conducted by the foreign minister, the president is still expected to know at least what role Indonesia should play in the midst of global turbulence. Both candidates might rely on the classic free and active foreign policy doctrine. This decades-old concept is to be favored by all candidates when dealing with a changing international order. However, at least some new interpretation is needed to cope with emerging issues. That is a steep order for the campaign teams of the two candidate pairs. Nevertheless, without fresh foreign policy initiatives in mind, we will only witness empty talk between two presidential candidates who, if elected, will have to help the nation survive in global turbulence. The writer is pursuing a PhD at the School of Political Sciences and International Studies, University of Queensland, Australia.